Sheffield middleweight Jez Wilson came through his first fight in 17 months last night to set up an intriguing local derby and title fight with Dronfield's Lewis Taylor. Wilson, 36, outpointed Bath-born journeyman Dan Blackwell at Barnsley Metrodome over six rounds. The modest win moves the Crosspool fireman to 12 wins, two losses and a draw. he said it had been a "very good" tune-up. And it will have given him confidence and breaking his jaw in his previous fight against John Ryder. 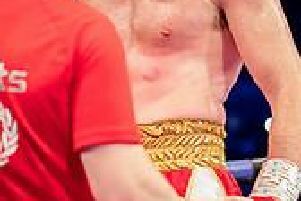 But more signficantly, it aided his preparation for the attack on 25-year-old Taylor's English championship belt, on November 21, at the Magna Centre, Rotherham. In the bout of the night, Barnsley's Ben Wager was beaten over ten rounds by Kofi Yates, for the Central Area super lightweight title.